Director – Ron Howard, Screenplay – David Koepp, Based on the Novel by Dan Brown, Producers – Brian Grazer & Ron Howard, Photography – Salvatore Totino, Music – Hans Zimmer, Visual Effects Supervisor – Jody Johnson, Visual Effects – Double Negative & Instinctual, Special Effects Supervisors – Gabor Kiszelly & David Watkins, Prosthetic Makeup Design – Ivan Poharnok, Production Design – Peter Wenham. Production Company – Columbia Pictures/Imagine Entertainment/LStar Capital. Symbology professor Robert Langdon wakes up in a hospital in Florence with retrograde amnesia, unable to remember anything that happened in the last 48 hours. He is told by his doctor Sienna Brooks that he was brought in after receiving a bullet wound to the head. A woman disguised as a member of carabinieri comes shooting and Langdon flees with Sienna. In his clothes, he finds a biological containment tube keyed to his thumbprint that contains a projector. This displays a classical illustration of Dante’s Inferno, although one where there are clues embedded in the painting. Deciphering these, Langdon realises that they spell out a trail of clues to where the late bio-geneticist billionaire Bertrand Zobrist has left a deadly virus intended to purge 95% of the world’s population. Pursued by authorities, members of the WHO who want to contain the virus and rogue members of the organisation who want to sell it to the highest bidder, along with a secret cabal, Langdon and Sienna flee across Europe, deciphering clues that Zobrist has left in classic artworks that lead to the location of the virus. Inferno was the third of the films adapted from Dan Brown’s best-selling series of novels about symbologist Robert Langdon, following The Da Vinci Code (2006) and Angels & Demons (2009). Inferno (2013) was actually the fourth published of Brown’s Langdon novels. The Langdon films have ignored the order of the books, focusing on the mega best-selling The Da Vinci Code (2003) first and then going back to adapt the first published Angels & Demons (2000) as a sequel. Dan Brown published one other book in between The Da Vinci Code and Inferno with The Lost Symbol (2009). However, Ron Howard and Tom Hanks declined to be involved as The Lost Symbol was prepped to be adapted as a follow up Angels & Demons. The reasons for this are not clear – perhaps something to do with the book’s plot involving Freemason conspiracies and Islamic terrorism. With the publication of Inferno, they clearly saw the opportunity to leapfrog The Lost Symbol and proceed with that instead. With Ron Howard, Tom Hanks and scriptwriter David Koepp back on board, Inferno is exactly what we expect from another Robert Langdon film. That is to say, Tom Hanks furiously running around Europe, muttering cryptic deductions based on clues hidden in classic artworks; his accompaniment by the equivalent of the Doctor Who (1963-89, 2005– ) companion of the show – a girl whose prime purpose is to ask what technical things mean and have to be rescued; and their pursuit by various authorities and secretive international cabals. Inferno uses different artworks and locations but is still essentially the same plot as The Da Vinci Code where the only real difference is that it involves Langdon and a girl searching for the McGuffin of a deadly virus instead of tracing the bloodline sired by Jesus Christ. (If there is little else that can be said for Angels & Demons, it is that it didn’t so blatantly rehash the first film). Inferno soon gets fairly ridiculous. Either the plotting has been so condensed for the purposes of on-screen pacing or the film wasn’t able to pack in the detail about each scene that Dan Brown did in his book but it feels like a story that leaps in skips and deductive bounds. As in the other films, you are never invited inside Langdon’s process of ratiocination so there is no sense of watching a detective story unfold. However, the more you actually think about what is going on on screen, the less sense any of it makes. For one, you have a mad biotech billionaire who wants to wipe out half the world. No particular problem with this, we have had James Bond villains before – Zobrist is not too different from Hugo Drax in Moonraker (1979). For reasons that only make sense to the plot, he has an obsession with Dante Aligheri and has secreted various cryptic clues in classic artworks around Europe as to the location of his virus. Why, for instance, didn’t he just release the virus rather than leaving a trail for people who have the power to stop it – in fact, actually setting up an organisation with the express purpose of leading Langdon on the trail? For that matter, once people work out what is going on, surely it makes more sense if Langdon simply refused to follow the trail and find the location. (Things are slightly different in the book, the ending of which was excised by the film, where it is revealed that Zobrist had already released the virus and it is going to cause the population to die off by becoming sterile). Equally, the scheme that Langdon gets dragged into is laughable in its contrivation. [PLOT SPOILERS]. There’s the whopping coincidence we get in the first few scenes where the very doctor that has chosen to tend Langdon also happens to be a scholar of the very same classic work in which the clues are hidden. By an even greater whopping coincidence, we also later find that she is also the girlfriend of the mad billionaire and has been conspiring to find the virus and activate it herself. 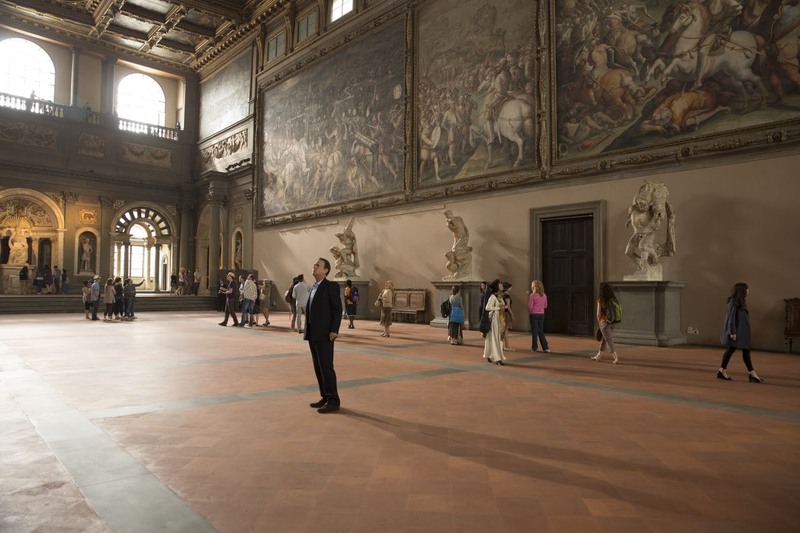 Admittedly this is later revealed to be a set-up, which leads to the most ridiculous piece of plotting – the revelation that Langdon’s entire presence in Florence, his having amnesia, his being in hospital and even being shot at, is all an elaborate scam to get him to solve the puzzle. Why the WHO going to him and asking “Hey Robert, this mad billionaire has left this trail of clues in artworks across Europe that lead to the whereabouts of a virus that can kill 95% of the world’s population. How about lending your expertise to save the world?” would not have achieved the same purpose is beyond me? (Indeed, Sidse Babett Knudsen asks exactly that in the flashback scenes). This is all thrown together with a plot that involves all the principal players changing their allegiance and apparent loyalties at least once throughout. The most ridiculous of these is the sinister organisation – which seems to have zero purpose in the film other than to sit about and manipulate the events Zobrist has set in motion – who variously decide to defy orders, eliminate Langdon and then change their minds and save him. For that matter, it is never even clearly explained what purpose was served by Zobrist setting them up to cause Langdon to have amnesia in order to find the way to the virus. This is a film that on the slightest glance is nonsensical mishmash of plotting that makes no sense whatsoever. Ron Howard’s other films of genre interest are:– the mermaid comedy Splash! (1984); Cocoon (1985) about a meeting between geriatrics and extra-terrestrials; the George Lucas sword-and-sorcery collaboration Willow (1988); Apollo 13 (1995) based on the true life 1970 space mission disaster; the Dr Seuss adaptation How the Grinch Stole Christmas (2000); the supernatural Western The Missing (2003); and Solo: A Star Wars Story (2018).